The Hatley Castle - Historical Places of Victoria, B.C. Victoria’s second castle, the Hatley Castle, is also a National Historic Site like its counterpart, the Craigdarroch Castle. The two castles were commissioned by the Dusmuir family, namely Robert and James at different times, with James, the eldest son of Robert, retreating to his estate in Hatley Park in his retirement. Of the two, Hatley Castle is more likely to be recognized thanks to its role as Professor Xavier’s School for Gifted Youngsters in the movie “The X-Men.” Aside from its Hollywood highlights, the Hatley Castle has had its fair share of history, having been perched out in its lush grounds since 1908. Like father like son, the inside of the castle was constructed with no budget in mind, which is demonstrated by its extravagant details. Paneled rooms of oak and rosewood with teak floors, fantastic fireplaces and specialty light fixtures set the pace of James Dunsmuir’s desires. The insides of the castle are rivaled in extravagance only by the castle grounds, which are extensive and are now a well-kept part of the Hatley Park National Historic Site. 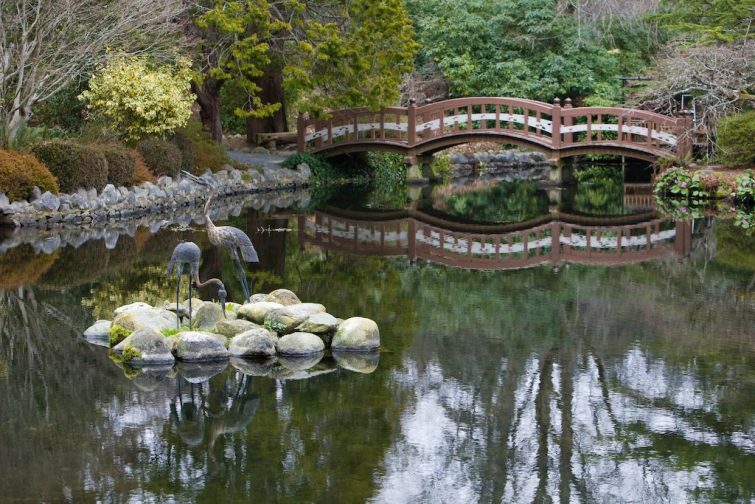 Nearly 650 acres make up the estate lands, with three unique gardens: the Rose Garden, Italian Garden and Japanese Garden. These are an absolute must to take a wander through while in the area. James Dunsmuir was fond of flowers and greenery, and had a conservatory built on the property at an incredible cost. It allowed him to fill the castle rooms with flowers throughout the year. James Dunsmuir died in 1920 and his wife and daughter continued to live on the property until 1937. Then came its next stage of life as a Naval Training Establishment, the HMCS Royal Roads, from 1940-1942, and as the Royal Canadian Naval College at Royal Roads until 1947. By 1968, it became the tri-service, Royal Roads Military College, which ended in 1995, and Royal Roads University was born. 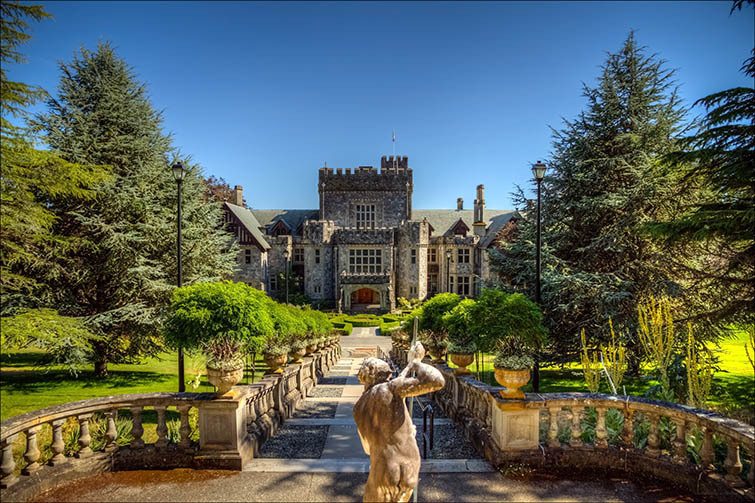 Today, Hatley Castle is the administrative centre of Royal Roads University, and sits in Hatley Park. Walking estate tours take place during the week, but guests can also opt to do a self-guided tour by donation. The castle’s estate boasts some of the most beautiful and longest-surviving Edwardian gardens in the entire country. You will feel absolutely regal and be transported back in time as you take in the stunning views of the Olympic Mountain Range over the Juan de Fuca Strait, while making your way along brick pathways and sweeping staircases of granite. 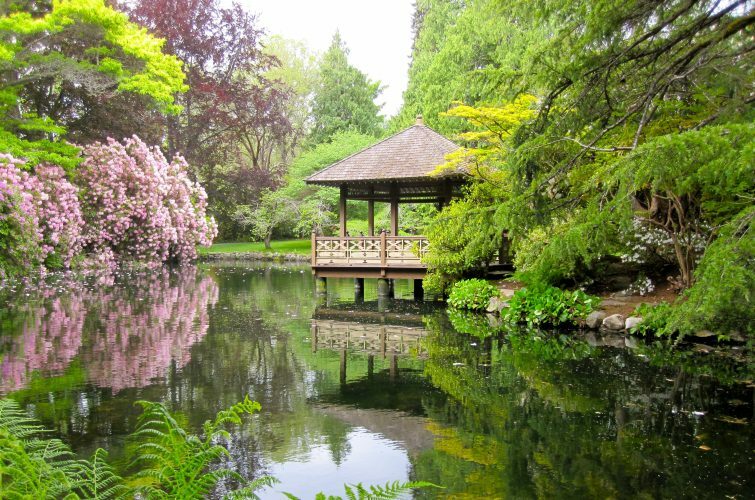 Crossing through the croquet lawn, you can enjoy the history and symmetry of the Italian garden, adorned with statues and colourful annuals, explore an enchanting woodland, and find a bit of peace and Zen when across the bridge in the Japanese gardens. The heritage rose gardens lead straight to the famous conservatory, which once held a large banana tree in its center. With both the historical side of the castle, and the horticultural side of its extensive estate, the Hatley Castle and the Hatley Park National Historic Site make for a unique visit worthy of an afternoon.